Since self-mythologizing is a key part of Donald Trump’s brand, it is a near-certainty that the public will be hearing a few glowing anecdotes about the supposed greatness of the GOP candidate’s father, Fred, between now and November. But there is one chapter of this story that Trump is bound to skip right past, even though it denies him the opportunity to drop a famous name from American history. 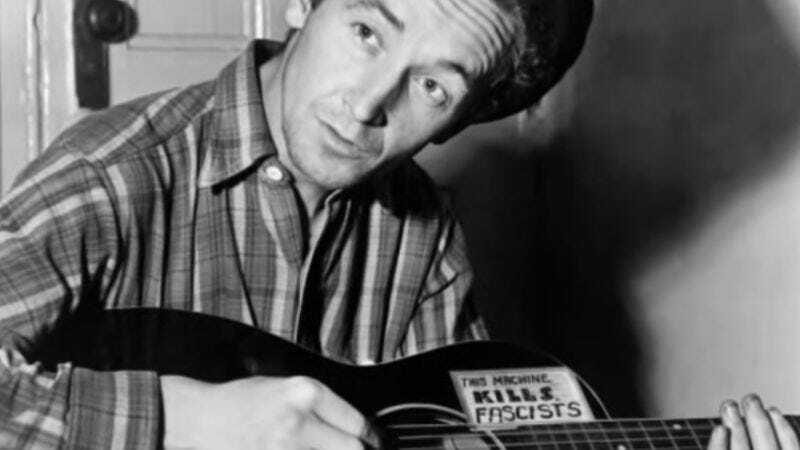 It seems that, for two years starting in December 1950, the elder Trump was the Brooklyn landlord of legendary folksinger and rabble rouser Woody Guthrie. Consequence Of Sound’s Collin Brennan has written an eye-opening piece about the “oft-contentious relationship” that existed between these two men. Since Guthrie’s whole deal was championing the disadvantaged and disenfranchised, strumming protest songs on a guitar bearing a “This Machine Kills Fascists” sticker, it is not surprising that he and the Trump family would not get along. But what is surprising is that Trump’s father actually merited mention in Guthrie’s notebooks. All that remains to be done now is for some modern-day guitar-picker to put Guthrie’s 66-year-old poem to music and perform it outside every Trump campaign event for the next four months. Interestingly, “riot folk” artist Ryan Harvey has teamed with Rage Against The Machine’s Tom Morello and Ani DiFranco to record a new version of “Old Man Trump.” Check it out.